Sushi doesn't necessarily mean raw fish and rice. How about quinoa instead of rice and some creamy avocado, cream cheese, crip spring onion and smoked salmon for a change? Rinse the quinoa thoroughly with cold water and add it to a pot with the double amount of water and bring it to a boil. Turn down the heat and let it cook for about 15 minutes. The quinoa is done when the skin slightly peels off. Drain off the water and add the quinoa to a flat bowl. Mix rice vinegar with about ½ tsp of salt and sugar and stir it under the quinoa. Bevor you begin to roll your sushi the quinoa has to cool down completely. Nori leaves don't like heat and rip apart. Wash the spring onions and split it into thirds. Halve the avocado, remove the seed and cut stripes into it. Scoop it out with a spoon and put the avocado stripes aside. Place a nori sheet on your sushi mat and spread the quinoa evenly on it, leaving out about a cm on the top and bottom. Cut a slice of smoked salmon into stripes and place it in the middle of the nori sheet. Spread a layer of cream cheese on top. Add the avocado and spring onion. Hold the filling in form with your fingers and roll it together. If the nori doesn't hold by it self wet the edge slightly with water. Press the roll together firmly - but soulfully. 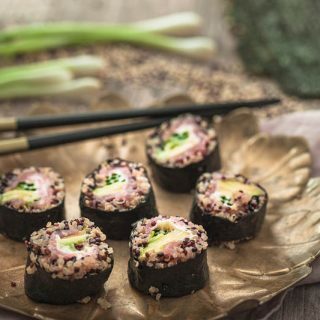 Quinoa sushi goes well with soy sauce, wasabi and pickled ginger.